Added on May 9, 2014 by Tamara Rafkin. It took a while after the events last year to get back to this project. That being said I'm pleased to post the newest 2 strands of worry beads.... and I've made myself a promise to myself to get as many more finished this Summer as possible while I have a bit more time. Added on October 2, 2013 by Tamara Rafkin. huge thank you to John Bigalow for stepping in and taking this image for me. Added on September 5, 2013 by Tamara Rafkin. this worries project has taken on a mood and life of it's own, little did I know when it began as an idea, a spark, a concept how it would unfold and wind it's way around my days. some projects happen quickly and some slow like a tree growing- effected by the seasons, rain and sun. this one is slow - giving the attention and care to the worries I've been given to transform is a heavy task at times. so far while working on this project my own life has brought it's own worries and made it difficult when absorbing the worries I've been intrusted with - last year brought my mother's death after a lifetime of her struggling with mental and physical health issues plus after her death complications arising from the social system that was her guardian. It took most of the year to resolve the issues that came with it all. yet, in the midst of that I managed to progress, albeit slowly working my way through more worries when my own were able to be put to the side (and all the while continuing on both my photographic work and ceramic studies). As I was working with all of this, a new set of worries came to me from a dear friend that wanted to participate in my project for which I was grateful- not just for the want to contribute but as a sort of way I could help this friend who was fighting cancer to hopefully ease their mind. As this year came with it's fresh start and more emotional space to continue, I got back to work on the worries....finally getting to share some of beads with their contributors, to make the photographs of the beads in their hands. In between that creating more beads around written worries, firing them, releasing them....and I worked on my list continuing on in the order they have been sent to me. April rolled around and it became more apparent the worries from the friend fighting cancer needed to be transformed... I made the beads, they went into the fire and one of them cracked (the first in all of them that I've made that has broken in the oven, maybe the worry was too strong). I glazed them to look like the ocean reflecting this persons love of the water and ability to float/surf through life, handling all that life has thrown and maybe also embodying my hope for the friend to get past these worries. next glaze - out of the kiln and again unplanned results, all the beads had small unglazed pin prick spots on them in random patterns - which when I stared at them made me think of constellations. So I decided they they must be filled in in gold leaf, like shining lights in blue water - a reflection of the stars. ...all the while threading the beads that look like stars in the sky. Added on March 6, 2013 by Tamara Rafkin. Feeling...and they were touched pt. 2. Added on January 18, 2013 by Tamara Rafkin. Usually when it's quiet on this website it's because work is being created ( in and around life happening), over the past several months more of the Worries portraits have been created - uniting worrier and beads... here adding to the work in progress are a sampling of new portraits. Added on September 4, 2012 by Tamara Rafkin. The worries project shall be in final form an installation work. Each of the strands shall be photographed in the hands of the worrier and in exhibition form they will be presented together (with other elements to come later). This is the first "portrait session" to date with many more worries and worriers to bring together before it is ready for installation. Added on May 25, 2012 by Tamara Rafkin. Added on March 7, 2012 by Tamara Rafkin. gently, carefully wrapping clay around each sentence. slowly rolling, forming each bead into form. gently precisely grooving and cutting the incision to spiral round...then burning and baking, glazing and into the fire and smoke... living, breathing and changing as life does. the project goes forward; the second worry bead strand made, porcelain wrapped around the written words of the worrier. sometimes as difficult as the words, the beads posed their own tests for me as maker, artist and transformer. Added on September 26, 2011 by Tamara Rafkin. Worries - we all have them. They keep us awake at night, can influence our behavior and at times be great motivators. My newest work and "series" is about these thoughts, some of which can be some of our most private inner conversations. Inspired by a perfect combination of family history ( catholic and jewish family - both known for worrying),a natural forward progression in my work ( having dealt with loss of innocence/ fear of what is in the shadows in No Adults Allowed & safety/ security/ the need to shelter from the outside world in Sleeping Houses ) and an adopted Greek grandmother that collected worry beads; my new body of works are mixed media, ceramic and photographic, "portraits". 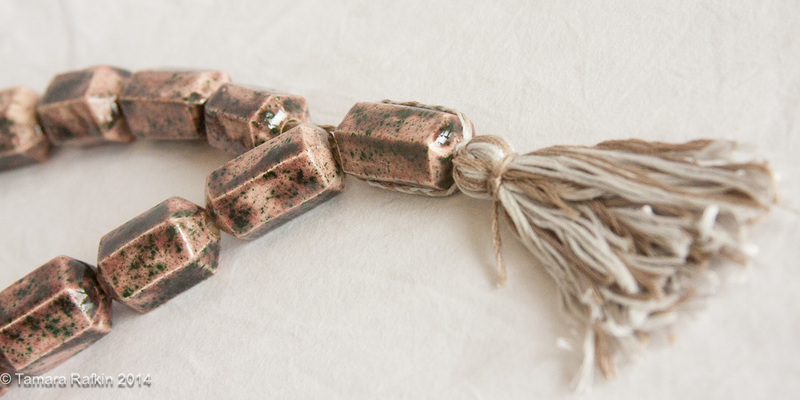 Worry beads are something to sooth the soul, to handle while nervous, to give a place for worried energy to go. I decided in dealing with the idea of worries, not only to delve into the concept of worrying but to try and transform the worries I’m dealing with. I’ve asked several people to write down their worries for me, specifically 19 to 21 worries they have, as a strand of worry beads has 19 to 21 beads per strand. With their worries I am creating actual ceramic worry beads- one strand of beads per person- forming the beads with the actual written worry. As the beads are made, the clay must be fired in an oven to transform it into a ceramic bead at which point the written worry is burned up, not able to withstand the heat of the oven. Depending on how it’s looked at this act of burning the worry either traps the worry in the bead or releases it into the smoke of the fire, both transforming the energy of the worry into another form. These strands of beads are made in a way to be somewhat of a portrait of the writer of the worries, via color, form, decoration and texture and after the strands are completed will be photographed in the hands of the worrier. These photographs, while not exposing the facial identity of the worrier shall be a portrait in full, as hands can sometimes be more descriptive than a persons face. It is in beginning phases, this project is one that takes time – time and care to create the beads, time to travel and create the photographs; time to find the place to exhibit it as it exists in my head. I hope the journey to the final creation is as transforming as the work itself.